It was high time my family get back to traveling. The last outing we'd had was back in January to the Daun Wildlife Park, and here it is almost summer! Sadly, the clock is ticking and opportunities to explore are becoming less and less readily available. Therefore, when our pet kennel contacted Alex with an opening for Memorial Day weekend I pounced on the two nights faster than you can spell out spontaneous vacation. I had heard through the grapevine that the Netherlands hosted a fun amusement park and since I had never been to that country before, I hopped on the park's website and snagged one of their "last minute deals" and quickly formed an itinerary. Efteling hosts several types of sleeping accommodations, ranging from one bedroom cabins to themed suites, but since this trip was a last minute splurge I went with the less expensive option and got us a Comfort Family room inside the Efteling Hotel. The hotel was a pleasant surprise. I was expecting a standard European room with limited square footage and bare essentials. Instead, we were treated to a luxury-level resort with friendly staff and multiple park benefits. Our room contained a double bed, two singles, a table with two chairs, a toilet room, and a shower. In addition to being clean and ten times larger than I expected, the room was also air conditioned!!! That's almost unheard of in Europe and was without a doubt Alex's favorite aspect. Efteling is themed around Grimm's Fairy Tales and the room played into that effortlessly. 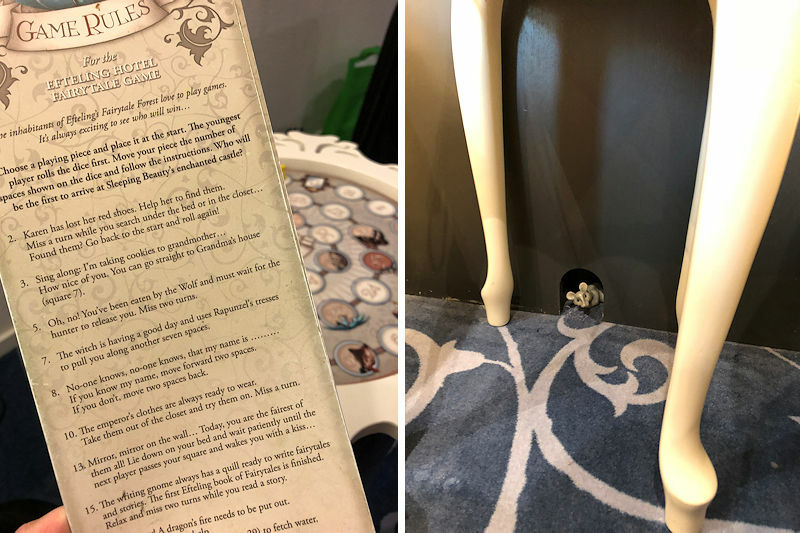 Little touches like a pair of red shoes in the closet (to go along with the red shoes story that was prevalent throughout the park) and the feather quill pen on the table brought the room from nice to adorable. The positives of the resort did not stop in the room. My family was given quite a few perks for staying "on site" that we took full advantage of. Tickets to the park's show, Raveljn, which could only be viewed with a ticket were available to be picked up the morning of at the front desk. (Think of it like a free Fastpass, Disney friends.) We were allowed to enter the park 30 minutes earlier than everyone else, and we had our own entrance and exit, which was less than 5 minutes away. There was also a free breakfast buffet included with our stay. I was extremely worried we were going to get a Disneyland Paris breakfast, meaning a couple cold cuts and some croissants, but Efteling proved me wrong. There were the meats and cheese and bread like Disneyland, but there were also eggs and waffles and bacon. I can't tell you what a difference some hot food makes when you're talking about breakfast. The four of us filled ourselves silly in the morning, allowing for us to only need a small lunch later in the day. It was a perfect setup. Speaking of food, the treats at Efteling were bad news for my weak soul. I snacked on stroopwafels, poffertjes, and coffee and indulged in roast duck, cheese boards, and hot frites. It's a good thing I'm training for a half marathon because I probably ate my weight in carbs! Tiny cinnamon waffles with caramel in between, stroopwafels are a favorite. Poffertjes reminded me of a funnel cake. Rides at Efteling ranged from carousels to dark ride throughs to thrill coasters. There were an abundance of each category as well as two playgrounds for kids to burn off energy and a fairytale forest with animatronic figures. Landon and I rode Halve Maen a total of 3 times and it astounded me each turn that little kids were allowed to go on it. This is the largest swing ride in Europe and lasts three times as long as RC Racers and the park was relying on parents to make the judgement call on whether or not their child was ready for the thrill. European kids' fortitudes are much stronger than mine was at that age! The biggest Must Do at Efteling was the show, Raveleijn. It had a beautiful score, talented actors, and enough unexpected surprised to make the twenty minutes pass quickly. The park provided a free headset that translated the show but it wasn't necessary. The music and action spoke for themselves. Without a doubt, my favorite thing we experienced at the park. Regardless of how many rides we went on or restaurants we tried, I think the trip would have been worthwhile had we simply gone and walked around the park. The landscaping was beautiful, the spring flowers were in full bloom, and the Pagode attraction offered a panaromic view of the surrounding nature park that was stunning. The small part of the Netherlands I got to see from both inside the park and along the road filled me with charm and peace. Whether it was the lusch farmland, the clusters of cows next to wooden windmills, or the cobbled walkways I was taken in by Netherland's beauty. 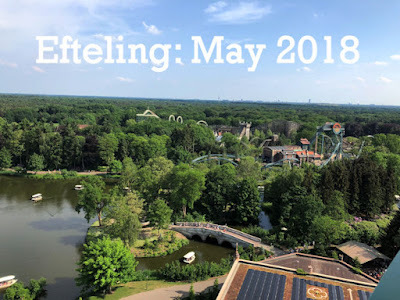 Efteling exceeded our expectations in every way possible, and I am beyond grateful that we were able to visit this charming destination.